Once upon a time there was a little girl called Fiona who lived in Dublin. But Dublin is full of colourful characters and creatures from the fairytale realm. Often not seen or heard, they reside in some of Dublin’s most famous locations and landmarks! Fiona’s journey is not as simple as it sounds, as she encounters snakes, trolls, a wolf and many other unusual denizens of the city. In this charming story, Fiona (dressed in her red coat) encounters snakes, trolls, a wolf and many other unusual inhabitants of the city - who knew Dublin was home to all these? Look closely at the illustrations and you will meet hosts of familiar characters in this lovely and unusual story. With its simple but quirky illustrations, this year’s treat for young Dubliners is, unquestionably, illustrator Nicola Colton’s first picture book, A Dublin Fairytale. 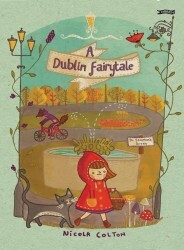 A playful and colourful retelling of Little Red Riding Hood, Irish style.